Click the “Buy Now” button to buy single or multi-user licences either with or without a support plan. Not yet ready to buy? Want to extend your Swiftlight trial by 60 days? For more details, click here. 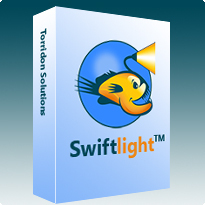 A Swiftlight user licence includes 30 days free support and access to fixes / patches for the version purchased. The Swiftlight Support and Maintenance Plan entitles you to free upgrades to new versions of Swiftlight as well as priority support. The price per year is 20% of the price of your licence. Click here for more details about support. We offer volume discounts for multiple user licences. The appropriate discount level will be automatically applied to your order based on the number of licences you select in the shopping cart. Find out about our non-profit / academic / student pricing. For your security and convenience all our online transactions go through our payments partner, Cleverbridge. Cleverbridge offer a full range of payment options: Credit / debit cards (Visa, Mastercard, American Express, JCB, Maestro, Solo) as well as PayPal, Wire Transfer, Cheque and Cash, in multiple currencies. If you don’t want to order online or if you have any questions, please call or email us at: sales@torridonsolutions.com. * Prices exclude any applicable taxes (e.g. sales tax, VAT, custom charges).